My stomach churns; I’m feeling excited – not exactly nervous, but psyched. I’m driving along narrow lanes, through a bleak and lonely area, looking for a grand castle. Suddenly, just like in a fairy tale, there it is, looming majestically in front of me. I go through my questions one more time and imagine how Gottfried Helnwein might react to them. 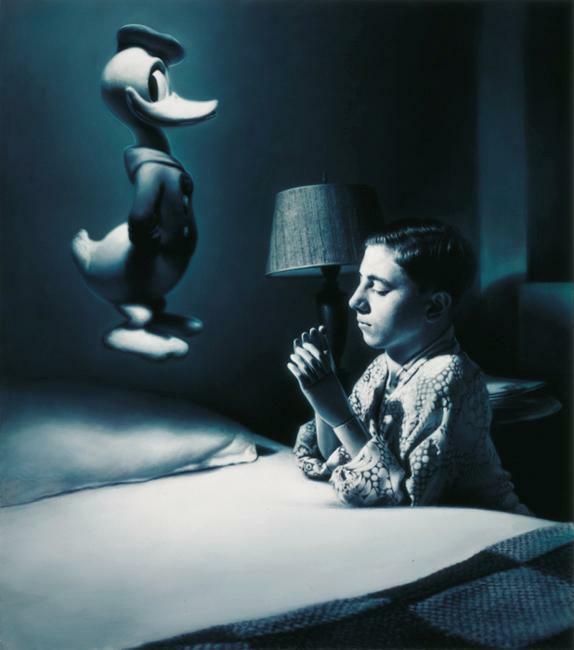 What shall I make of this man, who is deemed to be a huge fan of Donald Duck and yet creates such sombre images? Has he made his own Duckburg here, Helnweinburg, his own unique world – I am somewhat curious. Will he throw me in a dungeon until my questions ripen, or will he set the castle ghost on me – the one that has already flirted with Dita von Teese? I try to concentrate on the moment at hand, breathe – breathe slowly in and out, somehow it will turn out all right. It’s a foggy, cloud-streaked afternoon in Waterford County, Ireland. I’m meeting a man who has spent a large part of his life on this island that is famously steeped in tradition. He’s called this place home for some while. Ireland has a long history of treating its artists, literary figures and musicians well. This Austrian, with his distinctive appearance, is an ambivalent character. 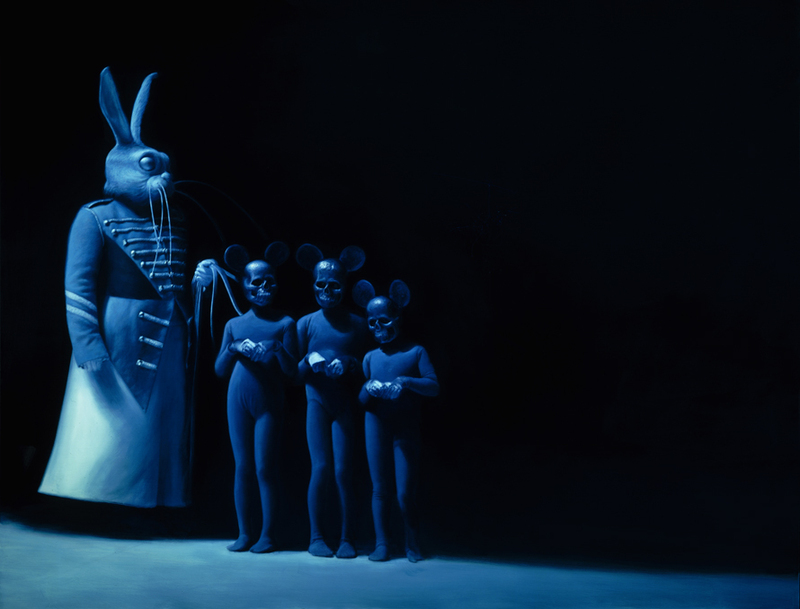 Helnwein’s main theme was, and mostly continues to be, violence and abuse. It wasn’t simply a case of deciding one day to explore this dark realm – no – as they say: the theme chose him. Many of Gottfried Helnwein’s works convey something disturbing. They often have something about them that won’t leave you alone. At the same time his pictures radiate a sacrosanct beauty that at times is breathtaking. His good friend and collector of his work, Sean Penn, once put it in a nutshell: “Well, the world is a haunted house and Helnwein, at times, is our tour guide through it.” And yes, despite all my qualms: I wasn’t locked in a dungeon and the castle’s ghost had no interest in me. After a few hours visiting this mystical castle, Gottfried and Renate Helnwein said a friendly goodbye. For a moment I imagined what it would be like to be lord of a castle myself. I step on the gas pedal and realise that I’m in my little hire car, and not a Rolls Royce. Pulled back into reality I drive away from the estate, glancing back for a moment and thinking to myself: what a world he lives in, what a man, what an inspiration! Stefan Jermann: I’ve just come from Waterford, where the over-sized Helnwein billboards that are all over the city blew me away. The young girls all look similar – are these different faces or are they all one and the same girl? Gottfried Helnwein: No, they are different children. The installation is called ‘The Last Child’, and it is spread over the whole of the city of Waterford. The biggest picture hangs on the Old Flour Mill. A white, 24 x 35 meter large, child’s face, with her eyes stretched wide open. SJ: You’ve been involved with the theme of abuse, pain and violence for a long time now – though at first sight these pictures are gentle, even dreamlike; the pain isn’t always consciously perceived the first time you see them and it’s very subtly conveyed – what exactly is the message that you want to put across to the viewer? GH: Essentially, this is the central theme that has run through my work since 1970. I believe that all the work an artist does, revolves around a single central concern or motif. Every work is like a new attempt, which may be more or less successful, to get closer to the central theme, to make it visible, to grasp it, to formulate it. In principle though, it is intangible, so it cannot be grasped and has no form. I became involved with the theme of violence very early on, especially violence towards children. In the course of my research I have seen forensic photographs of children who were beaten or tortured to death – mostly by close relatives. The number of children, who die every year in this way, is very high. You don’t easily forget those pictures. In the 60s and 70s the media didn’t generally take up this theme. Back then, my first pale watercolours of bandaged and wounded children caused an uproar in Austria, people put stickers on the pictures declaring them to be ‘degenerate art’, exhibitions were cancelled and once my work was confiscated from a gallery by the police under the Mayor’s orders. SJ: Why were these children killed by their own parents – was this a post-war phenomenon…? GH: Violence against the weak and defenseless is as old as the human race. Worldwide, there are probably more slaves now than there were in the time that slavery was legal. Since Austria suddenly came to the world’s attention again recently as a result of the Fritzl case, the foreign media have been speculating about Austria’s ‘dark side’, and some have promptly been reminded that this aspect has long been a theme in Austrian art. In literature as well as in visual art. And it was my pictures, above all, that invaded people’s consciousness. The sort of woodcut picture that the international media uses to illustrate Austria, when they notice it at all, is annoying sometimes. A few years ago when I was in America and my nationality was brought up, people would immediately say: ‘Ah – Waldheim!’, later: ‘Ah, Haider!’, then it was ‘Fritzl!’. If it weren’t for Arnold Schwarzenegger and Mozart, Austria would be fucked, PR-wise. SJ: But how did you begin to be so intensively involved in this theme at a time when it was still taboo? GH: Maybe I suffer from some kind of obsession with justice. I just can’t comprehend how anyone can enjoy being violent towards another person who is totally defenseless. The first revelations about the holocaust, although limited, were the trigger. I soaked up every detail that I could discover, and as I saw how sadistic concentration camp guards and murderers were being acquitted, time stopped for me right there. I suddenly became aware that all the worthy bourgeois around me had taken part in the biggest mass murder in history just a few years earlier. Instantly I didn’t feel part of that society anymore. I don’t think history has ever seen such a radical schism between two generations. In the 60s, young people all over the world rebelled against their parents’ generation, as they no longer wanted to be identified with it. At about the same time I also began to get involved with the history of the Catholic Church. SJ: Did you have a strict Catholic upbringing? GH: I spent a large part of my childhood in a fog of incense in the naves of cold churches, surrounded by martyrs writhing in ecstasy and covered in blood, flaming hearts wreathed in thorns, crosses, instruments of torture, mystical stigmata and dying virgins gazing in rapture towards heaven. The ‘bible picture book-comic’ the ghostly flickering red lamp, the Latin murmurings of the priest and the monotonous whispering of litanies and rosaries, the mummified corpse in faded brocade behind semi-opaque windows, the High Mass and processions accompanied by the ringing of bells – all this dug its way deep into my childhood soul! Christianity is the first religion to have put pain, bleeding and death at the centre of its spirituality. For the first time, God is not only associated with triumph and cosmic power, but with human wretchedness, agony, fear, indignity, suffering, failure, succumb and death. Christianity has influenced the history, art and culture of the last 2000 years like no other ideology. But very early on I encountered a totally different, huge, new culture, which resulted in a culture shock to me: I met the man, that changed the course of my life: Donald Duck. SJ: How old were you when Donald rescued you, as it were, from this sombre view of the world? GH: I was about five years old when I first stepped on Duckburg soil. SJ: What was your relationship with your parents like when you were a child? GH: I always had the feeling I had landed in the wrong place. I was like an extraterrestrial being who had been abandoned on a foreign planet. Post-war Vienna was a dark and tragic place. The grown-ups seemed to me to be ugly, ponderous and bad-tempered. My parents were actually lovely people, but were shy and timid, and trapped in their lower middle class world. SJ: You couldn’t develop, because you wanted to escape from this world? GH: It was a world that had experienced Armageddon twice: the collapse of the monarchy, the rise and fall of Nazi rule, two World wars lost. From the entire Austro-Hungarian Empire of the Habsburgs, all that remained was the capital city with a bit of land around it, largely cut off from the world by the iron curtain. Although we were officially a free democratic country, the ghosts of the past weren’t easy to shake off. Of course, the government, the justice system and the bureaucracy were full of ex-Nazis. And you could feel it. SJ: Could we talk some more about your current installation in Waterford: I’ve been asking myself why the children you portray are all girls – why don’t you include boys as your subject? GH: Actually I always just refer to children. Man as an androgynous being. I’m interested in the short phase of childhood when one is not yet ‘broken’ by the process of being brought up. When the gender issue doesn’t yet play much of a role, when creation and imagination appear to be endless and the world of one’s own fantasy is more real than alleged reality. I’m preoccupied with vulnerability and presumed innocence. I’m always looking for the ideal model, though appearance as such doesn’t play such a large role. It’s this hard to define, intangible quality that used to be called ethereal, a radiance or aura that you only see in very few children. And mostly it is girls of a particular age who have this quality, like apparitions from another world rather than flesh and blood. SJ: What do you think passers-by in Waterford make of the portraits, some of which are bathed in blood: what do you think goes through their heads? GH: I think it’s caused quite a stir in this small city. There have been lots of calls made to the town hall or the radio station. Some are enthralled by the installation and others get worked-up about it. But I’m amazed how respectful and fair the remarks have been. But this is the Ireland I’ve come to know ever since I’ve lived here. It’s the most tolerant country there is. SJ: But the Irish also have quite a sense of patriotism, or has this more to do with the preservation of culture? GH: The Irish have never started a war of aggression in their entire history, though invaders have marched in time and again. The English occupied Ireland for 700 years and they treated the people like slaves. They were not allowed to own any land, were forbidden to use their own language and in the 19th century the population was halved as a result of the great famine. Despite all this, no one has succeeded in breaking the Irish. The Irish identity has been maintained through the years by their music and literature. These large-format billboards all over the city with my images of children might be like another invasion: representing something of a challenge to the people here. SJ: Maybe you expected a little bit of scandal – also because here’s this foreigner, an Austrian, who wants to show the Irish how the world works? GH: Ireland is the only country I know where there’s no xenophobia. A lot of foreigners have moved here in the last few years, looking for work – from Asia and Africa and about 150,000 people from Poland alone. Until now I haven’t heard that anyone has a problem with that. When we arrived, 12 years ago, I had the feeling of being at home for the first time in my life. SJ: Your billboards are all over the city and they have almost the same aesthetic as advertising – but we don’t really know what they mean because there’s no text to go with them. Now, advertisers want to sell – but what is your agenda? Are you aiming to provide food for thought? GH: That’s exactly the point. At first people have no idea what these pictures are about. No explanation or solution is offered, like we’re used to with advertising. People have to find their own answers to these pictures. For me art is a dialogue. And as Marcel Duchamp said when he defined art, these two poles, artist and observer are necessary, in order to make something like electricity. This is exactly what’s happening here in Waterford. The people are affected emotionally, they talk about it, they are enthralled or they are outraged and protest. Isn’t that exactly what art should do? SJ: How would you describe yourself. You don’t make a sombre impression on me, in fact the opposite. Does it actually take a good dose of humour to even be able to deal with such dark themes? GH: I had absolutely no choice. I didn’t go looking for my theme; I was in the middle of it right from the beginning. It was ordained by my environment and art was simply my way of trying to break free. It’s necessary for my survival. In general people are very sensitive to themes such as pain, injury and death in art, but when it comes to entertainment, like film or video games, they can’t get enough of it. SJ: Let’s come back to the subject of your models. How does it actually work when you conduct a ‘session’? Do you have an exact vision in mind of how the picture should look before you start and does it stretch out over a long period of time? GH: It’s usually a process that’s spread out over a longer time. As a rule I work in cycles. For me, working with children is very inspiring. I give them as much freedom as possible and don’t explain a lot. I leave it up to the intuition of the individual child. A photo session usually runs like a game, and the child and I develop what takes place together. Sometimes I’ve had the good luck to find models that have an enormous radiance and purity and I’ve worked together with them over several years. I found just such a child here in Waterford. Her name is Molly – she’s the 34-metre high “Waterford Child” on the Mill. I dedicated “The Last Child” project to her. SJ: Do you go out on the streets yourself to ask people, or the children if they would like to model for you? GH: I look around, among the people I know, or on the streets and then the parents come to my atelier with their children. I do a test session to find out whether it works or not. SJ: All four of your children are artists themselves now. To what extent did you encourage them? GH: In a way I’ve made them my campaign of revenge. I wanted to avenge my own childhood, which was so undignified, uninteresting and wretched – and above all plagued by idiotic rules, taboos and feelings of guilt. When I was a child I swore that I would give my own children complete freedom to make their own decisions. Including whether they wanted to go to school or not. SJ: So did you bring your children up in a completely anti-authoritarian way? GH: No – free. The term ‘anti-authoritarian’ comes form the neo-Marxist scene and the hippie movement of the 60s. I never saw myself as authority but as an ally. To raise children you don’t need any ideology or psychology, just love and respect. Simply give a child his dignity and strike up a partnership. It’s really very simple. I always imagined roaming through the country with my children in a lawless, sort of band. That’s about what happened. We’ve lived in different parts of the world, all my children have become artists, have different nationalities and although they have children of their own now, we all still live together, like a Sicilian extended family. SJ: But I assume your children did have to go to school…? GH: I left the decision up to them. To my amazement they all enjoyed going to school. SJ:Numerous famous people are intensive collectors of your work. One very enthusiastic collector is Sean Penn, who has also made a film about you. To what extent are good relationships with ‘celebrities’ an advantage in this field? GH: Mostly my friends are other artists – particularly artists whose work interests me. Strangely, it’s mostly with writers, people in the theatre or musicians that I sense this particular closeness and trust and have developed friendships. I don’t know many painters. SJ: How long is the wait for a Helnwein? GH: Actually it’s always longer than planned. I have a long list of people, who, thank goodness, are blessed with the virtue of patience. Posted in Interviews, Painting and tagged Art, Gottfried Helnwein, Interview, Interview G, Painting, Realism.